NOTE: It has been a LONG time since I’ve done a book review. Sometimes, the review is based on a book that I’ve rec’d from the publisher/author to write a review (and this is noted in the first line of the review), sometimes I review a book that I’ve just finished reading and want to tell the world what I think, and sometimes, I want to write a review of a book because it has something unique, something that I would like all (knitters, readers, people of sophistication) to know about. 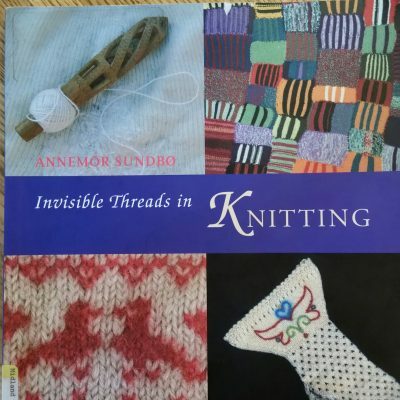 This is the third type of review: Invisible Threads in Knitting is a book for all knitters who want to understand knitting tradition, who want to understand folk knitting or how knitting fits the larger scheme of social history. The author, Annemor Sundbo, a Norwegian cultural/social historian, has written a treatise on how motifs, colors and materials explain the cultural history of Norway … and how this history intertwines with other world cultures. Published in 2007, this paperback book is a fascinating read: an overview of how the “traditional Norway” knitting designs actually hearken back to early Christian beliefs, pagan beliefs or pure superstition. Turns out the heavily patterned yokes, cuffs and hems of sweaters were a way of protecting the wearer from evil spirits getting to the wearer’s body. The motifs, Christian symbols spread throughout (stars and crosses and hearts) all serve as talismans for safety and “all good”. Sundbo, who owns a wool-recycling company in Norway, has collected thousands of hand- and machine-knit examples to back up her treatise. She has also done extensive research in her native Norway as well as throughout the region, research which verifies her findings. 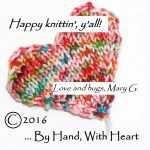 This book is eye-candy for the colorwork knitter … social commentary and cultural history. This book is a must-have on the shelf of knitters who want to delve into the whys and whats of folk-knitting! Sundbo has written other books on the history of Norwegian design including: Setesdal Sweaters: the History of Norwegian Lice Patterns, Everyday Knitting Treasures from the Ragpile and Norwegian Mittens and Gloves — all well-worth including in your knitting library, too!